Cubane was never supposed to exist. Deemed impossible to synthesize due to predictions that it would be extremely unstable, hypotheses about cubane’s strange properties were long confined to the realm of speculation. But in the early 1960s, researchers Philip Eaton and Thomas Cole at the University of Chicago made the risky decision to attempt the synthesis—and they succeeded.1,2 Half a century later, the researchers’ reports describing how to trap the capricious compound continue to spawn new discoveries, many of which they could never have anticipated. Early predictions of cubane’s tremendous instability and unique properties alike stemmed from its shape. The bonds between the carbon atoms that represent each corner of the cube are all separated by just 90 degrees, far from the ideal 109.5 degrees. Forcing the carbon atoms into this immensely strained geometry shouldn’t be impossible per se, but it should be about as difficult as bending a cast iron skillet with your bare hands. If the challenge of coercing the atoms into such a strained shape alone didn’t lead early investigators to consider cubane’s synthesis impossible, the likely instability of the product would probably have discouraged them. If a substance decomposes before anything can be done with it, potentially causing a dangerous explosion in the process, why even attempt to make it? The key to capturing cubane actually rested in a further commonality with the cast iron skillet. Although challenging to bend, once deformed, the cast iron tends to retain its new shape. Likewise, once Eaton and Cole synthesized cubane, it held its new structure. Unexpectedly, rearranging cubane into a more stable structure would require a vast quantity of energy—much more than is available to the pure substance at room temperature.3 Cubane’s decomposition is energetically favorable but incredibly slow, a phenomenon known as a kinetic trap.4 Thus, although it was experience and wit that allowed the researchers to conjure up the many steps required to synthesize cubane, they owed much of their success to the surprising properties of the substance itself. The fact that cubane doesn’t spontaneously fall apart enabled investigators to conduct detailed analyses of its chemical characteristics. Because of the geometric constraints placed on cubane’s atoms, its orbitals—where the electrons reside—are necessarily warped relative to most other compounds made of the same types of atoms and bonds. This quality has allowed experimental investigation of concepts that were once mostly theoretical. Cubane’s other special properties have also led to investigations of its practical applications. Cubane’s compact shape and crystallinity make it extremely dense compared to other hydrocarbons, the chemical family to which cubane belongs. High density combined with the enormous amount of energy released by its combustion might make cubane derivatives suitable as a jet or even rocket fuel, since the total volume both types of vessels can carry is limited. 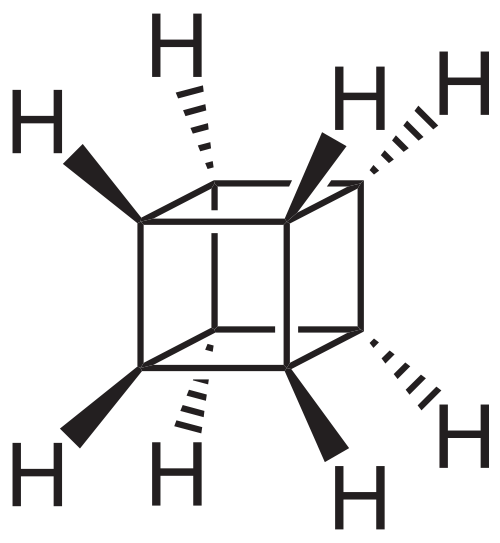 Furthermore, some cubane derivatives made by linking additional atoms to the cube’s structure have proven to be more reactive than their undecorated predecessor. One such derivative, octanitrocubane (ONC), is actually predicted to be capable of generating a faster, higher pressure explosion than the infamous trinitrotoluene (TNT).5 Even more promisingly, ONC doesn’t tend to explode until it’s activated, unlike its many heat- and shock-sensitive counterparts. If the manufacturing expenses can be reduced, ONC may stand to become a member of a new generation of safer, yet more powerful explosives. With cubane’s potential to benefit society still being uncovered fifty years after its creation, there’s no doubt now that the “impossible synthesis” was worth undertaking. Some of the practical uses and theoretical implications must have been foreseen by Eaton and Cole. Despite the potential payoff, it’s hard to imagine how a similarly far-fetched project would even get off the ground now. The intensely competitive funding climate in academic research today favors projects that start with a massive amount of preliminary data and little chance for failure. But cubane was born in a different era, somehow both more formal and more relaxed. Eaton and Cole reported their results in two separate papers just half a year apart, which might seem outlandish in the cutthroat research arena of 2015. The practice has faded into antiquity, largely due to fear that releasing scientific findings in pieces would allow competitors to anticipate the next logical steps and siphon off credit for the research, but also because of pressure to submit a paper that represents a “complete story”. Further reflecting the academic Zeitgeist in the early 1960s, the first cubane papers are written in a first person, conversational tone despite beginning by addressing the reader as “Sir”—as was ostensibly customary or perhaps even required by the journal at the time. (This was before the women’s liberation movement, after all.) If it seemed improbable fifty years ago that rearranging available starting materials into cubane could work—and that the resulting product might actually be useful—the likelihood that anyone who would prefer not to be referred to as “Sir” might want to read about chemistry must have seemed even more minuscule. Despite great strides in the intervening decades, progress toward diversity in science has lagged behind the pace of research itself. Stories of both social and scientific progress, it seems, tend to linger on for a while without a firm conclusion. At least when it comes to cubane, though, things are looking up. The investigation of cubane’s applications has accelerated in recent years, as simpler syntheses have been devised and awareness of its properties has spread. But one has to wonder what inspired Eaton and Cole to pursue a project of such apparently unlikely success and whether they would be able to secure grants to fund it today. On this topic, as with the many uses of cubane and related materials yet unknown, we can only speculate. 1­Eaton PE, Cole TW. The cubane system. J Am Chem Soc. 1964;86(5):962– 964. 2Eaton PE, Cole TW. Cubane. J Am Chem Soc. 1964;86(15):3157–3158. 4Eaton PE. Cubanes: Starting Materials for the Chemistry of the 1990s and the New Century. Angew. Chem, Int Ed. 1992;31(11):1421–1436. 5Eaton PE, Zhang, M-X, Gilardi R, Gelber N, Iyer S, Surapaneni R. Octanitrocubane: A new nitrocarbon. Propellants, Explos, Pyrotech. 2002;27(1):1–6. 6Mahkam, Mehrdad, Nasser Sharifi Sanjani, and Ali Akbar Entezami. Regulation of controlled release of ibuprofen from crosslinked polymers containing cubane as a new crosslinking agent. J Bioact Compat Polym. 2000;15(5):396-405. © Nicole Haloupek 2015, All Rights Reserved. to bookmark your site and retain checking for fresh material.